I don't know if you guys caught it, but I appeared on the TV show, "Ang Pinaka" Last September 29, on GMA News TV. I was asked about the top food crazes in the Philippines. 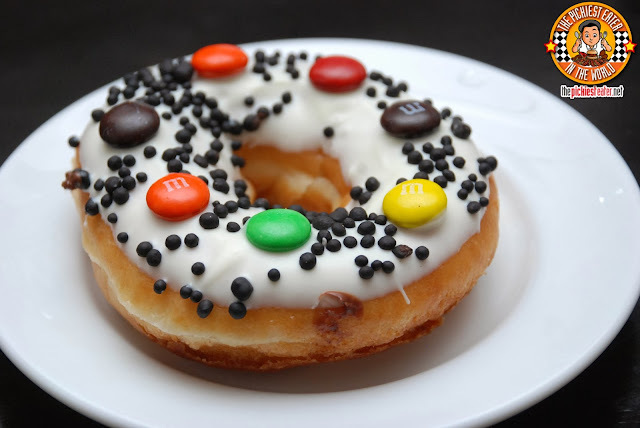 One of the crazes in question, was Donuts. Even though we were discussing about a particular brand, I couldn't help but blurt out that, no matter what toppings out put on a donut, my all time favorite will still always be, the simple, Original Glazed donut of Krispy Kreme. I don't know if the Hot Light Girl was watching, but she must have said something to the effect of, "Challenge Accepted", and before I knew it, a tin can of Krispy Kreme Premium Chocolate Creations donuts arrived at my doorstep. 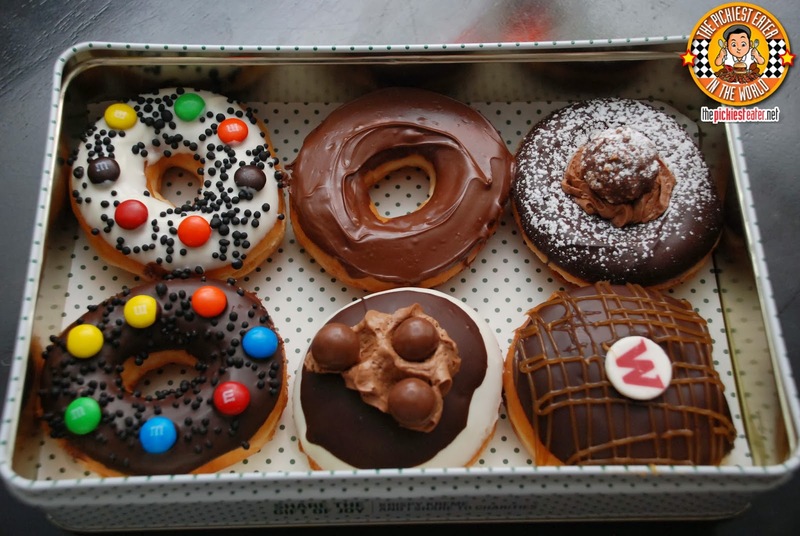 The geniuses over at Krispy Kreme concocted some mouthwatering donuts, using some of your favorite brands of chocolate! I find M&M's, especially just the plain ones, really addicting. Which is why I enjoyed the White Chocolate Frosting.. While Rina, in true Rina fashion, preferred the Dark Chocolate variant. 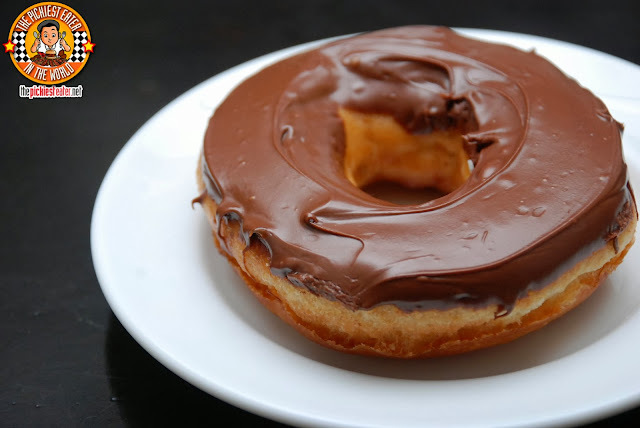 I almost did a triple backflip when I found out that Krispy Kreme has a new Nutella Donut! Just like roughly around 99% of the free world, I'm a huge fan of Nutella. Although it had a generous smearing of the hazelnut spread on the donut, I truthfully couldn't find the pronounced flavor of Nutella that we all know and love. Krispy Kreme also has Maltesers' Donut! 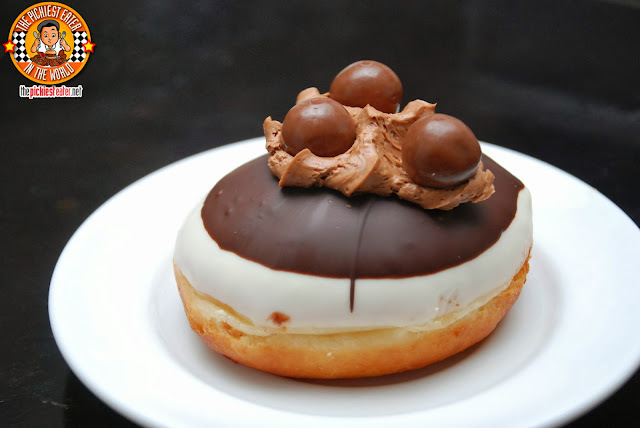 The donut has three Malteser Balls perched on top of the donut, resting no a chocolate cream "pillow". The only problem is, expect one or all of the balls to fall off when you either bite it, or cut your donut with a fork. The hazelnut flavor that was missing in the Nutella Donut was very much alive in the Ferrero Rocher Donut. 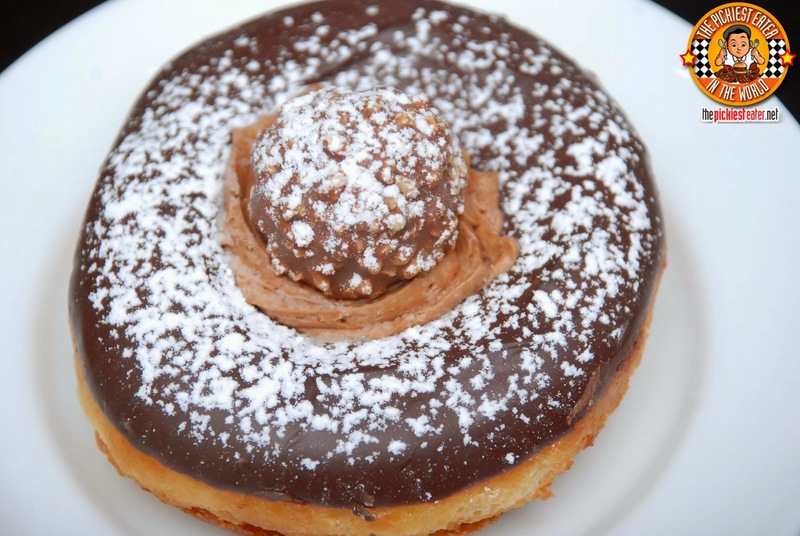 An entire Ferrero Rocher Ball was placed in the center of a chocolate frosted donut with a chocolate filled center. Delicious! What are your favorite Chocolate Bars? Mars Almond Bars are definitely one of mine (Next to Twix, Watchamacallit and Reese's Peanut Butter Cups). The Mars Donut was sort of like a deconstructed Mars bar. 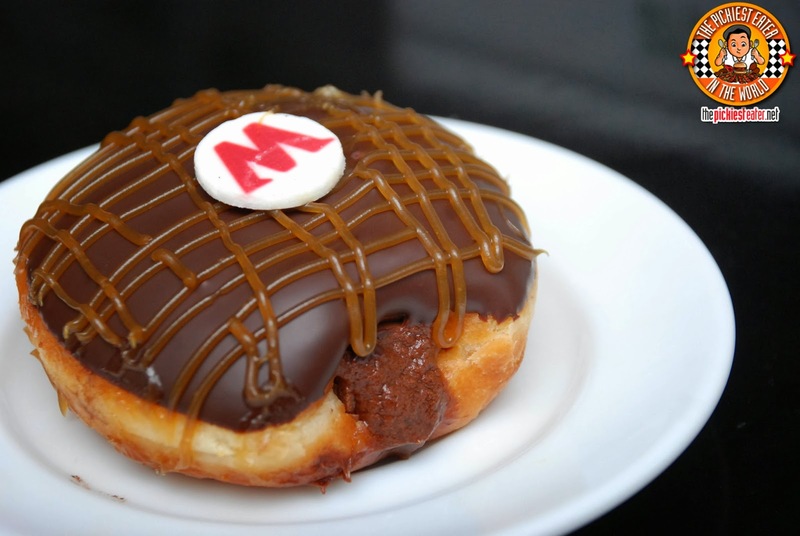 It has a heavy drizzling of caramel on top of its chocolate covered donut. Inside is chocolate nougat that.. although it was quite good, it failed to bring back memories of one of my all time favorite chocolate bars. As delicious as all of these were (With the Ferrero Rocher being the one I enjoyed most), none of them were enough to overthrow Krispy Kreme's Orginal Glazed as my favorite Donut of all time. On the whole, this was a great collection of Donut flavors from Krispy Kreme. 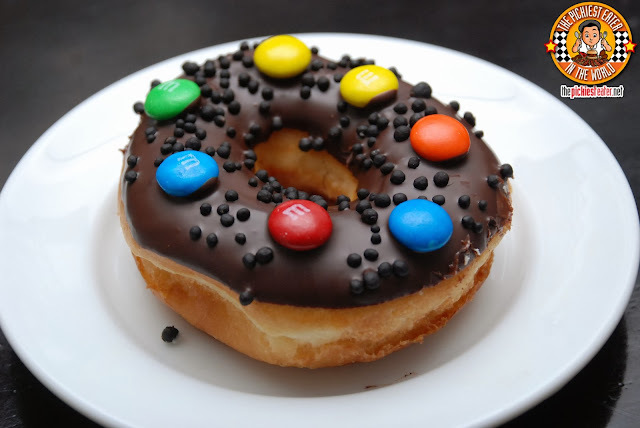 I think of Krispy Kreme's Premium Chocolate Creations as the "Avengers" of the Donut World. Woooooaaaaahhhh! I was planning to buy all of these flavors last Sunday in Ayala but I forgot to because of I had to run a lot of errands. I will definitely go to the nearest KK branch and try these new flavors. I think I belong to that 1%. hehe.. But those donuts are real mouth-watering! Running to SM North now to satisfy my craving. Also, I hope they'll last and not just for a limited time. Like you, I love the original glazed and the simple sugar donuts. But this chocolate monster should try their Ferrero Rocher soon! : ) I love Krispy Kreme. Not only because their donuts are really delicious, their donut-making process is very clean and their service is fast and efficient!